News from today, between snow and ice storms. 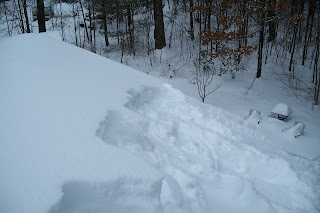 Much like winters long ago, the snow keeps piling up all over the place, including on the roof! I get a little anxious when I can start measuring it in feet instead of inches. What to do? I know better than to try to go up there and shovel it off...I know, put one of my sons up on the roof with a shovel. He's young and so much more flexible than I, should he catapult off the peak! While I tended to the driveway and walkways, Matt climbed to the top of the place and pushed a whole bunch of the stuff earthwards! 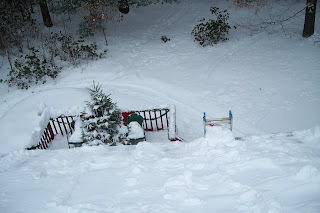 This picture he took, upper right, is looking down at the back deck. That's our Christmas tree, still standing up outdoors. Each year we move the tree out in phases. Phase III is "place on deck and hang bird seed cones on it." Phase I and II of tree "move-out" have to do with having to be told several times to "get that tree out of here." Anyway, once again I forgot to hook up the outside stereo system, so I didn't have this tune to accompany Matt while he was struggling to stay put on a 30 degree, ice laden slant, but you can listen to the music here, while you check out pictures below...and I thought as he was moving about on the roof moving snow that had blown about up there that it was ironic that the group that sang this was "The Drifters!" Here's a pic of Matt standing on the ladder with a roof rake. Nice try, but very energy draining as you push and pull while trying to balance on a metal ladder in a sleet storm. I know, as I tried this for two minutes before I handed the rake off to Matt. He did a pretty good job of getting the edges, but with a forecast of 10-12 more inches of the stuff, I wanted to clear a bunch off the whole roof. His idea, put on a pair of Crampons and get right to the slopes! When I saw the gear he was putting on his feet, with half inch steel points, I immediately imagined hundreds of cuts in the shingles and protested! "Can't you just take off your boots? You'll have better traction with your bare feet!" He gave me a funny look and settled for my pair of Crampons that had coils...no nail-like daggers! I'm like OSHA, safety first! And as long as I was on the ground, I knew I was safe. The picture on the right is what Matt saw "up there." 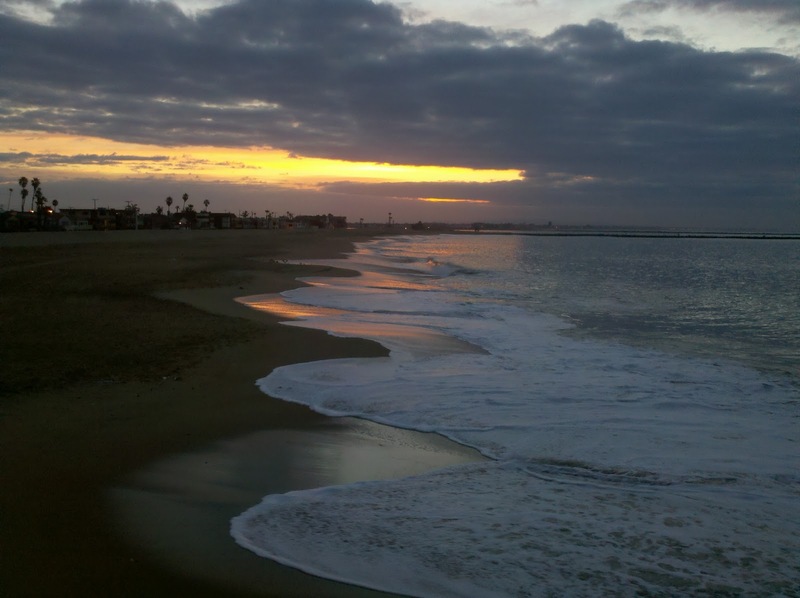 The picture below is what I saw, down here! 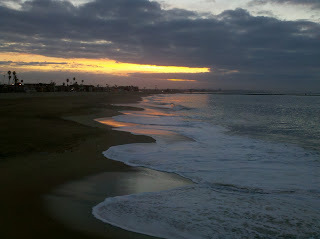 That's because I was checking my email and got a message from Seal Beach, California! 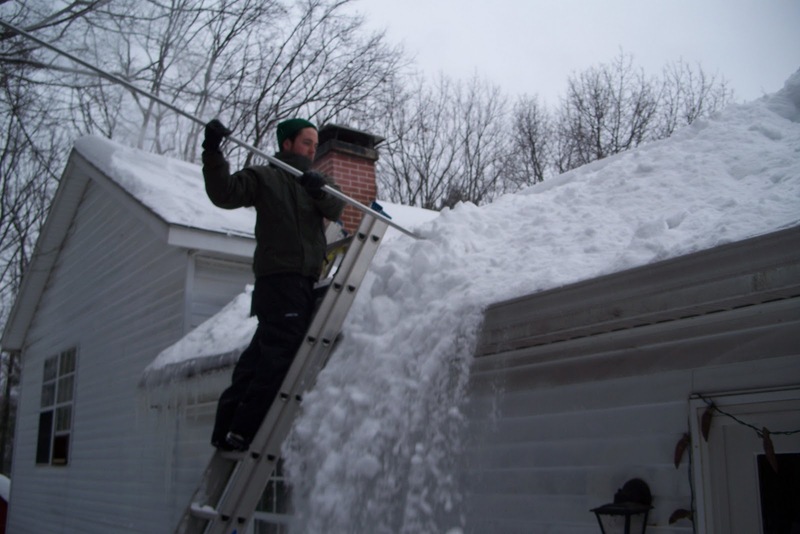 Back to the snow and the roof, Matt did a great job...clearing both the front and back roofs. And, he managed to get on and off the roof using the ladder. 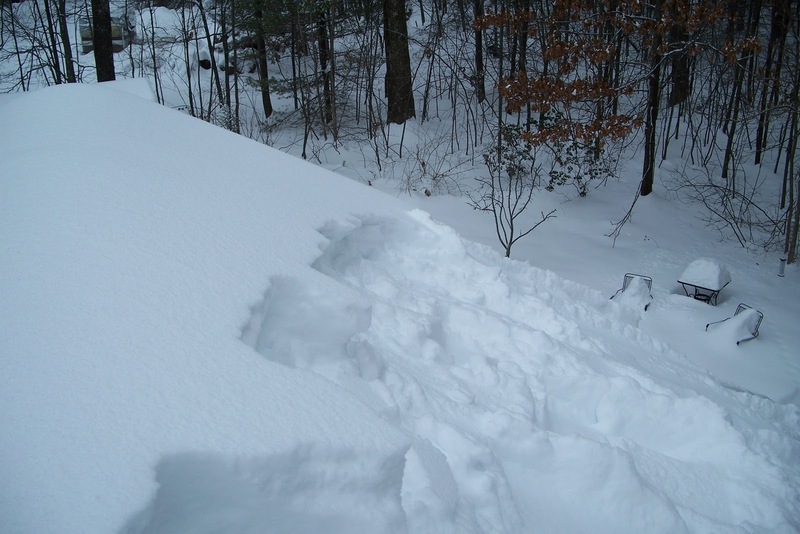 Due to his efforts, there were some four and five feet snow piles next to the house to soften the blow, but he ran around up there like a mountain goat and I think he enjoyed it. Every time I had instructions for him, shovel this way, do this not that, he would smile and say, "Sorry, can't hear you!" Just like the song, something good about being up on the roof!